Yea– More John McLane fun! A little less plausible, yes, but I’ll take it. 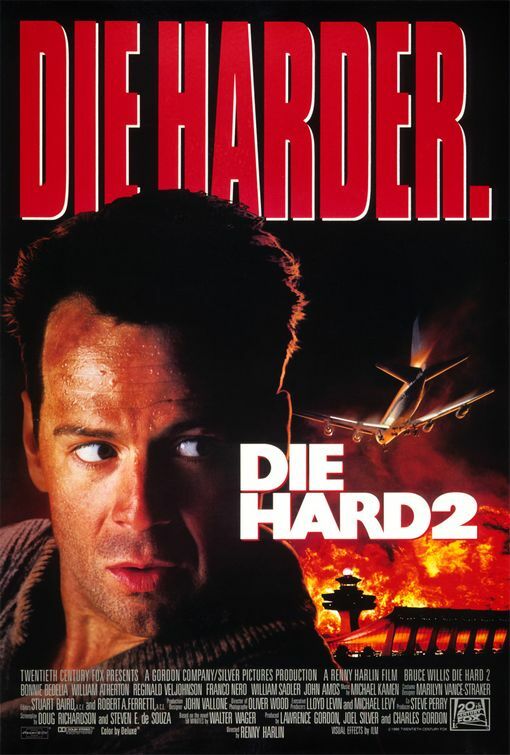 Die Hard 2 has almost everything the original had that made Die Hard such a fun outing: John McLane firing bullets and sarcastic quips at bad guys while covered in blood; a crazy, but somehow believable ransom plot; McLane’s wife in peril due to said plot; and all this set against the backdrop of Christmas Eve. So what’s missing? For starters, a certain level of plausibility. This movie takes place exactly two years after the events of Die Hard, and the events are essentially the same. A plot is afoot and McLane just happens to be in the right place at the right time, again. This time he’s crawling through air ducts at Dulles Airport instead of in an office building, but he’s still the only cop to realize that something is off about the situation. This recycling of the first’s script outline doesn’t bother me that much. Is it unlikely that a cop would be caught up in two complicated hostage situations in as many years while off duty? Absolutely. But that’s kind of this franchise’s thing (though it does make me like the relatively unique plot of the third installment even more). Another let down is the villain. His personality and charisma so pales in comparison to the awesomeness of Hans Gruber that I cannot recall his name or face at the moment. In my mind he’s just a faceless guy holding a sky full of planes hostage in exchange for a drug lord/dictator who is being extradited to the US on drug trafficking charges. Seriously, even looking at the actor’s picture right now doesn’t bring to mind any scenes he was in. Lastly, a lot more innocent people die here than in the first. I guess this makes sense, the scope of the hostage crisis in this movie is much larger than in the first. But I kind of liked that the only hostage Hans Gruber killed was a total douche who totally had it coming. He had morals and standards, after all. The nameless, faceless bad guy here brings down an entire plane of innocent people just to make his point. Kind of a downer. So, Die Hard 2: not as good as the original, but still fun enough to watch again. Though for my money, I’d skip directly to number three. How do you top the greatest action movie of all time? Short answer is, you don’t. That doesn’t mean Die Hard 2 is not a really good film, it’s just not as good as the original. John McLane (Bruce Willis) returns as the sarcastic New York Police officer who is always in the wrong place at the wrong time. It is one year since the events of the first film and McLane is visiting the in-laws in Washington DC for Christmas. He is at Dulles Airport waiting for his wife Holly (Bonny Bedelia) to arrive from London. Also arriving at that airport is a deposed dictator (Franco Nero) being extradited for trial in America. A group of rogue military official seize control of the airport and hope to free the dictator and escape to a country with no extradition laws. They have prevented the airport tower from speaking with their planes in the air, so they must sit there circling the airport until they run out of fuel. McLane must stop them before his wife’s plane runs out of fuel and falls to the ground. I enjoyed this film. Willis is really great as McLane. He has a lot of charisma and attitude as John McLane. I feel like he owns the role after his second time playing McLane. What lets this film down is the villain. William Sadler is the leader of the fiendish military crew, and he is good, but nowhere near as good as Alan Rickman’s Hans Gruber was in the original Die Hard movie. It is the one thing about this film I found disappointing. I really enjoyed the new setting of an airport, it is not as claustrophobic as the office building setting from the first film, but McLane is still trapped there. It was a really interesting way to change up the sequel, but still have a familiar feel about it. I also liked the supporting cast, Dennis Franz is great (and clearly boning up for his future role in NYPD Blue) as the Captain of the airport police. Carmine Lorenzo and John Amos are having fun as the leaders of a special forces unit brought in to stop Sadler’s men. This is still a very good film. I like it a lot, it is not fair to bag this film simply because it is not as good as the original. I doubt any film could live up to the first film, it is one of the best action films ever made.